Will rising construction costs prompt owners to sell up? Single family homes could see construction costs rising by as much as $10 per square foot, but will we see an increase in property listings? REP investigates. Listing availability remains low in many of Canada’s busy real estate markets, and one Toronto-based broker says that’s not about to change, despite rising construction costs. According to a new report by consultancy firm Altus Group, construction costs for single-family homes could rise by as much as $10 per square foot in some of Canada’s more burgeoning communities, such as Edmonton, Halifax and St. John’s. However, Patrick Rocca, a broker with Bosley Real Estate in Toronto, says high construction costs aren’t the foremost reason for homeowners’ reluctance to sell. Homeowners have lately opted to renovate instead of relocate, further tightening an already demand-heavy market. Many had hoped that rising construction costs would finally tip those owners in favour of selling and moving up. But the cost of moving still outweighs that of a new kitchen. The cost of moving is especially high in Vancouver, where the average home price makes commission payouts all the more expensive, and in Toronto, where buyers must pay a provincial and a municipal land transfer tax. Further, detached house construction costs are set to drop in Montreal and Toronto, according to Altus, by $5 and $10 per square foot, respectively. Altus predicts costs to remain flat in Vancouver for 2015. 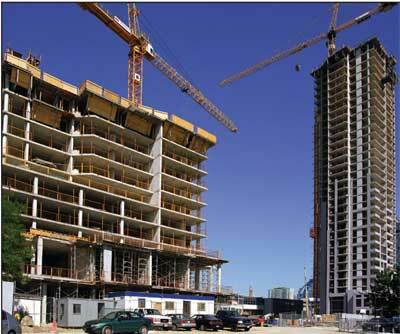 In the condominium sector, however, construction costs are expected to rise in most markets. In Vancouver, costs are slated to increase by $10 per square foot, to between $205 and $250 per square foot. Altus expects similar increases in Calgary and Edmonton.